Toyota Kirloskar Motor (TKM) has been awarded the State Export Excellence Award for the year 2014-15 in the category Platinum Distinction / Special Recognition by Visveswaraya Trade Promotion Centre (VTPC). Visvesvaraya Trade Promotion Centre (VTPC) is a mandated nodal agency for promotion of Trade from the State of Karnataka registered under the Karnataka Societies Act. VTPC has been operational since 1965 under the aegis of the Department of Industries & Commerce, Government of Karnataka. VTPC organizes State Export Awards, every year to promote exports from the state. The Government of Karnataka introduced these State Awards for best performance in exports since 1992-93, as one of the important steps towards recognizing the efforts of exporters. 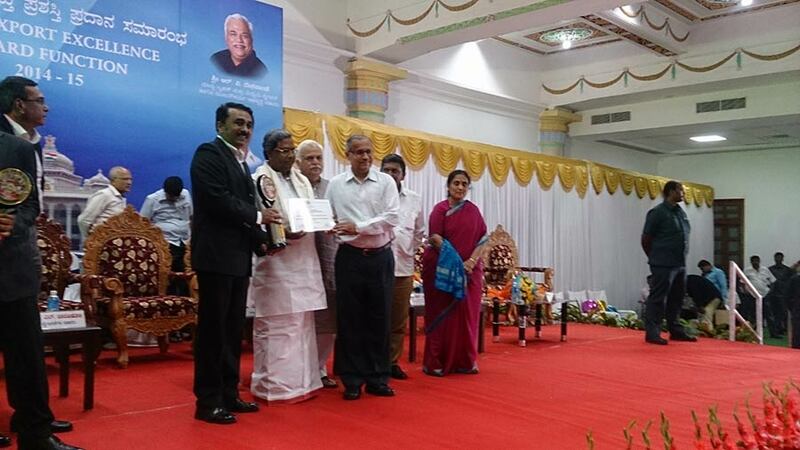 The award was presented by Shri. Siddaramaiah, Honourable Chief Minister of Karnataka at a function held in Bangalore on 23rd Aug 2016. The award ceremony also witnessed the presence of Shri. R V Deshpande, Hon’ble Minister for Large & Medium Industries and Infrastructure Development, amongst other dignitaries. Toyota Kirloskar Motor also carries the distinction of bagging the Export Excellence award by VTPC for 9 years, thereby underlying its contribution to national & state economy by exporting globally high tech auto parts & vehicles. TKM which has its world-class manufacturing plant in Bidadi near Bangalore Karnataka, exports CBU (Completely Built Unit) vehicles and Auto Parts to Japan, Thailand, Brazil, Indonesia, Philippines, Argentina and South Africa. The Government of India, through the Make in India initiative has created a conducive environment for the manufacturing industry. As a corporate citizen, we are committed to the all encompass growth of the country. Toyota Kirloskar Motor has aligned itself with the progressive policies, by developing globally competitive automotive technologies and processes at its plant facility in Bangalore. In the year 2014-15 the Karnataka’s contribution to all India exports was 17% making it one of the fastest growing states in the country. We strongly value our long standing relationship with the state and will continue to grow together through our focused contribution to the economy and the society.